(December 20, 2018) – The education system will now welcome 418 freshly minted trained teachers following the 84th Graduation Exercise of the Cyril Potter College of Education (CPCE) held today at the National Cultural Centre. Of the 418 graduate teachers, 76 are Early Childhood trained, 115 are Primary trained, 223 are Secondary trained and four are trained to teach in Post-Secondary Institutions. According to Principal of the CPCE, Ms. Viola Rowe, 13 graduates achieved passes with distinction, 403 passes with credit and two students achieved passes. The Overall Best Graduating student is Ms. Annamarie Isserdeen Samaroo from the Vreed-en-Hoop centre, Region Three. She received the Presidential Award of Excellence and the Prime Minister’s Prize. CPCE Principal, Ms. Viola Rowe. Best Graduating Student, Ms. Annamarie Isserdeen Samaroo receiving the Prime Minister’s Prize from Prime Minister, Hon. Moses V. Nagamootoo. Best Graduating Student, Ms. Annamarie Isserdeen Samaroo receiving the Presidential Award of Excellence from Minister of Public Affairs, Hon. Dawn Hastings-Williams. Prime Minister, Hon. Moses V. Nagamootoo. One major highlight of this graduating class is that five students have graduated with an Associate Degree in Information Technology. Ms. Rowe expressed her utmost confidence in the graduates since she assured those attended that the institution has strictly adhered to the entry criteria for each programme. The programmes from which students graduated are the Associate Degree two-year programme, the Trained Teachers’ Certificate three-year programme for Hinterland and Riverine Centres and the Associate Degree in Education one year programme. Moreover, in her Principal’s report, Ms. Rowe said that during the last reporting period it was projected that the CPCE would offer in this current reporting period, 2017 – 2018, in at least one location, in the North Pakaraimas Region Eight, Teacher Education and Training. She reported that this was achieved with the resuscitation of the Paramakatoi Centre. Further, Ms. Rowe said that it was projected that the College would design and implement an effective system of monitoring and evaluation which would include a strategy of the use of the staff appraisal instrument in all satellite centres. “This approach allows for gaps, limitations and strengths to be identified across centres,” Ms. Rowe explained. She said that the results would be used to inform the type and nature of development activities necessary at the individual centre and institution. According to Ms. Rowe this system was introduced in the reporting period in all satellite centres on the coast. Delivering the feature address at today’s convocation was Prime Minister and First Vice-President, Hon. Moses Nagamootoo. He told the graduates that they are graduating at a very exciting time in their life when Guyana is transitioning into a higher and richer society. He encouraged the teachers to be exemplary in their profession and to embrace the code of conduct that governs the noble professions as it relates to decorum and behaviour around students since those under their charge will seek to emulate their elders. Speaking on behalf of the Minister of Education, Dr. the Hon. Nicolette Henry was Director of the National Centre for Education Resource Development (NCERD), Ms. Jennifer Cumberbatch. In her presentation she said that it is heart-warming to witness the strengthening of the pillar of education and to welcome the new cohorts of teachers graduating from the CPCE. 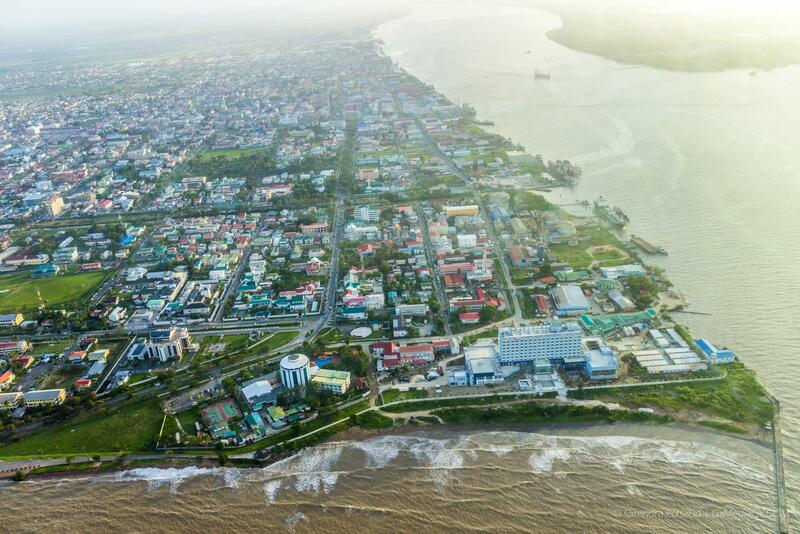 Moreover, she said that the Government of Guyana is committed to changing the educational landscape of Guyana and that the CPCE is a fundamental part of that change. Adding to the highlights mentioned by the Principal, Ms. Cumberbatch said that several meaningful improvements were made at the college. These improvements include, procurement of fumes cupboards, increased water supply to dormitories, provision of meals to non-resident students and the resuscitation of the Teachers’ Upgrading Programme in Region Eight. 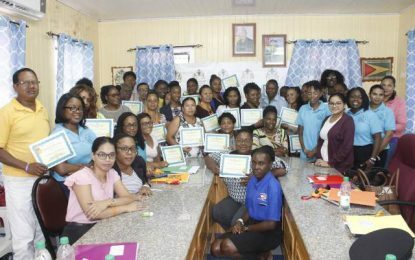 Teachers for the upgrading programme were drawn from 18 villages in Region Eight, sub-region one. These include: Paramakatoi, Chiung Mouth, Bamboo Creek, Chenapou, Itabac, Kaibarupai, Kurukubaru, Kanapang, Kopinang, Kamana, Monkey Mountain, Waipa, Tuseneng, Kato and Karisparu, Maikwak, Taruka. During the graduation exercise, a tribute was given to the late Principal Olive Lykeyn who was the first female principal of the college. She served from 1974 to 1979. The tribute was given by Sergeant First Class (Retired) Albert J. Bentick, BMus. Of the U.S Army. He had attended the institution when Ms. Lykeyn served as Principal.